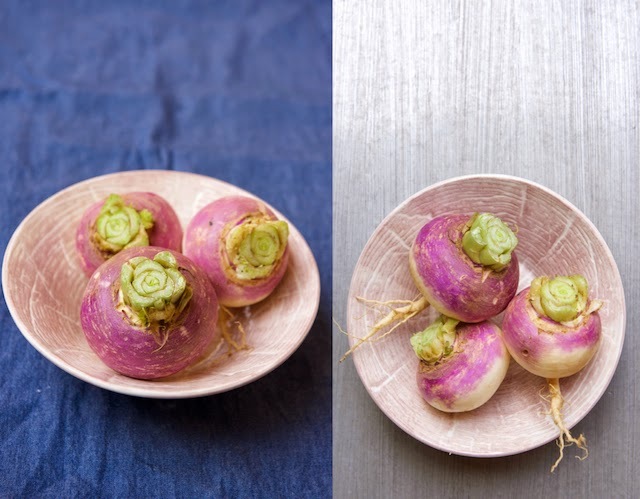 Turnips, IMHO, together with rutabaga, are possibly the most boring root vegetables (sorry, turnips! ), if it weren't for the pickled version which jazzes it up to an incredibly tasty, briny crunch. A great condiment in a pita with falafel or schawarma, or just in a plain ole' sandwich. It's also perfect as a mezze or a game day snack along with a cold beer. Besides, it just nice to make ahead and have these pinkish savory bites around the holidays. The Mediterranean version I am used to, is very basic, just the brine. I use the ratio of 3 tablespoons salt to 4 cups water. A North African friend of mine adds garlic cloves and bay leaves, so for this batch I thought why not?! I also, from time to time, like to add bruised black peppercorns, as opposed to red pepper flakes, when I wish to add a tad of zing to the pickles. This time I left the peppercorns whole. I must confess, that although I say the pickles will be ready within a week in the instructions below, I start nibbling on these super easy to make pickles a day in. A note about blogging...Food Wanderings turned five on November 3rd. Yep, five! I do question myself from time to time why doI keep doing this?! Then 101 Cookbooks' post 'Maintaining a Long-term Blog' came across my feed. It was eye-opening and inspiring to read about Heidi Swanson's attitude and approach. Just in time to give me a little jolt. I do love this little space that is Food Wanderings. It gives me an outlet to my creativity and nourishes my mind and soul. I hope it does give you some joy as well even if at the beginning I didn't fathom anyone reading it at all. Peel and cut the turnips and beet into batons. 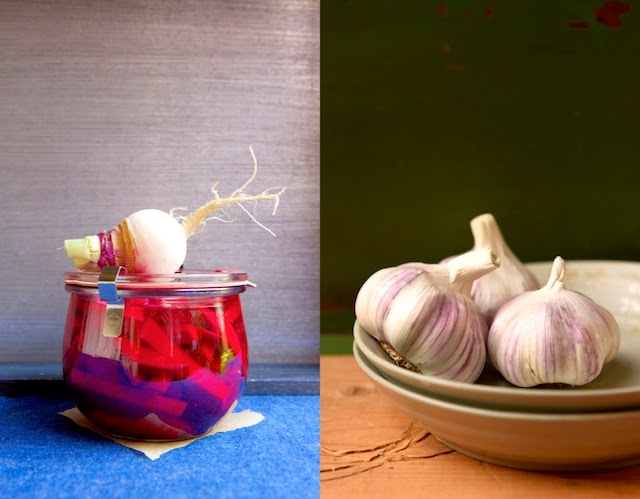 In one large sterilized jar, or equally divided into two smaller jars, layer the turnips and beet batons with the garlic cloves, bay leaves and black peppercorns. Add the water, vinegar, salt and sugar into a sauce pan and bring to a boil. Turn down to low and stir until the salt and sugar dissolve. Let it cool slightly. Pour the warm brine over the jar(s) and let it come to room temperature. Let the jar(s) sit on the counter for 5 days, with the lids loosely screwed on, to let the fermenting gases (carbon dioxide) release. Open the lid(s) once daily and then screw back on. Seal tightly with the lid(s) and move to the refrigerator. The pickled turnips will be ready within a week and last refrigerated up to two months. If you wish, can the pickled turnips according to the instructions here. You might have leftover brine depending on the size of jar(s) you are using. Congrats on your blogaversary! Your pickled turnips sound refreshingly crispy and delicious as well! If you have never tried a Gilfeather Turnip, you haven't tried a turnip. OMG, they're divine. They blend up like fluffy mash potatoes kissed with a taste of horseradish (as my b/f said). They also make a wonderful bisque. Johanna, i've got to look for the Gilfeather Turnips. I have never heard of them. I wonder if I without even knowing it had them in the past?! An interesting recipe and pickle! I love turnips. 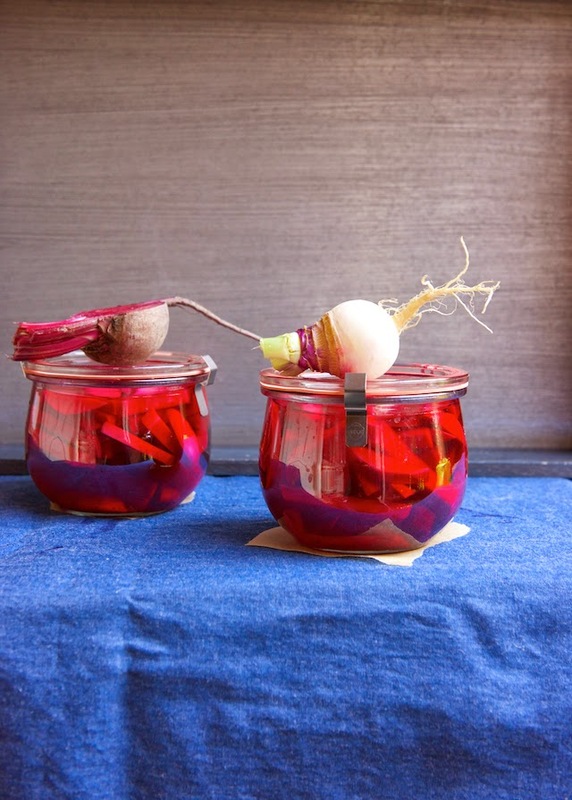 I do enjoy your blog and these pickled turnips are gorgeous! First I've ever heard of pickled turnips and I thought I'd heard of every pickle there is! Always learning from you Shulie! 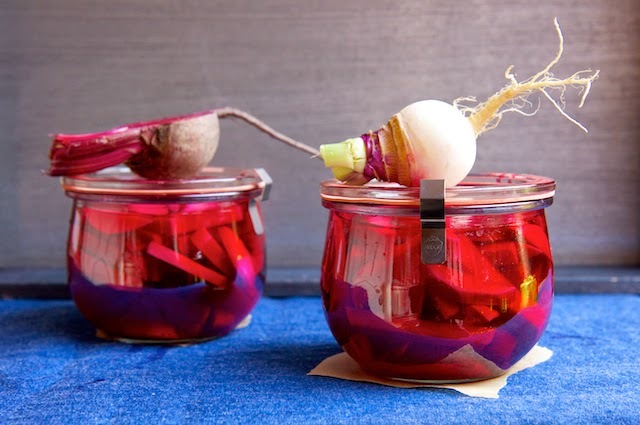 These pickled turnips looks amazing, Shulie! I'm sure the taste is out of this world. Happy 5th Blogaversary! I wish you many, many more years of sharing your recipes, and foodie point of view, with the world on your blog. You do a fantastic job! Congrats on 5 years! These are so different & interesting! Pretty too! First, congrats on your 5th year anniversary!! Second, I love a good pickled turnip. Though I agree, it is one of the most boring root vegetables, this pickled version with garlic is sprouting jazz hands. What? You don't see them? Turnips are only as good as whatever they're swimming in. Garlic and bay leaves in the brine sounds delightful!